D3O is a ground breaking impact protection solutions company that sells and licenses a range of unique patented smart materials. Smart materials are what my newborn will take for granted when they are adults. The D3O team of chemists and material scientists has engineered a range of new materials to bring rate-sensitivity and superior cushioning performance to the footwear marketplace and now offers an intelligent, responsive solution that absorbs shock, improves energy return, reduces injury and provides long-term comfort. D3O Schutt from D3O Lab on Vimeo. These British smart materials specialist developed a brand new range of cushioning materials specifically for footwear applications including athletic, industrial and military markets launching in July 2013. D3O markets a unique patented technology used to manufacture high performance, lightweight, soft and flexible materials with high shock absorbing properties. The raw material is strain rate sensitive. In standard conditions its molecules flow freely, allowing the material to be soft and flexible, but on impact, lock together to dissipate the impact energy and reduce the transmitted force. This market changing technology is used to produce shock absorbing materials which can be found in a range of products across the motorcycle, sport, footwear, electronics, military and workwear sectors. The new D3O Footwear range offers highly durable, efficient and effective solutions which perform across a wide range of impact energies. Designed to provide comfort, shock absorption and injury reduction, the range offers solutions suitable for running, hiking, trail running, racquet sports as well as military and industrial markets and is compatible with a wide range of underfoot applications including inserts, insoles, mid-soles, strobel boards. D30 will have a range of solutions for the athletic footwear market that offer impact protection and superior cushioning to existing materials found in the market. Their lightweight, highly durable materials, featuring D30 patented energy lock technology, have been developed to help reduce lower limb injury from repeated impacts in sports. Improved impact protection in footwear such as the midsoles has been linked to a reduction in lower limb injuries and D3O’s new heel-to-toe shock absorption range helps to reduce the impact trauma that commonly causes knee and hip injuries. The materials are suitable for a range of applications including running, trail running, racquet sports etc. D3O is a British based impact protection solutions company that markets a unique patented technology, used to produce a shock absorbing material. D3O was born out of the 2006 Winter Olympics, where they provided protective solutions to the US and Canadian ski teams. 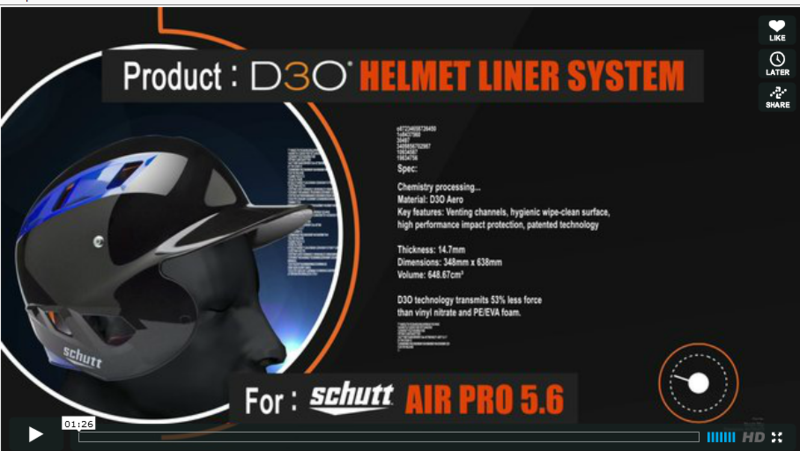 D3O impact protection solutions have been integrated into thousands of products worldwide and are used in 5 core markets including sports, electronics, PPE, motorcycle and footwear. Sports Techie, We live in an amazing time when a progressive company such as D3O can activate then material synthesis a patented smart material with unrivaled shock absorption while engineered for fit and comfort across sports and activity. This month D30 launches new smart cushioning materials specifically for footwear. Tomorrow, who really knows what’s in store at the D3O lab but one thing is for sure, they will continue pushing the sports technology Industry with sport centric products that are safe and affordable while offering people impact protection worldwide. 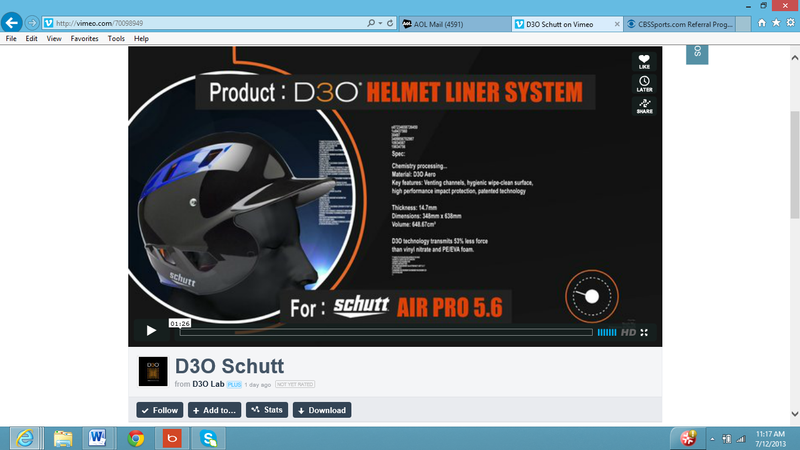 You have to love being a Sports Techie thanks to D3O and Schutt.